Shopping for springtime is always fun and exciting: it’s a time of rebirth, it brings feelings of rejuvenation, and it’s an all-around great time of year. When looking for a fun, classic, or unique accessory for yourself or that special someone around this season, there are so many options to choose from in the spirit of the spring. Read below for to learn about the best jewelry for spring! Once winter comes to an end, it’s a great feeling to start wearing jewelry that signifies the beginning of a warm season ahead! Much like the designer accessories that comes out for spring – filled with strappy shoes and sandals – jewelry can celebrate the change in weather as well. Jewelry that includes transparent details made of a clear acrylic called lucite, paired with crystal accents, are pieces that are perfectly suited for the style that accompanies spring. Whether this style comes in the form of a chunky bangles or dainty hanging earrings, they’re easy to wear with a variety of clothing, colors, and styles that fashionistas are attracted to wearing in the springtime. Jewelry that showcases tassels and fringe are all the rage, especially for the warmer months of the year. This trend is celebrated particularly by Parisian designers, featured on many couture designs. Jewelry designers have decided to mirror this trend with necklaces and bracelets that include fringe and tassels, blending in perfectly with the clothing trends of spring! Nina Ricci and Versace spring accessories have been known to feature these accents, so this jewelry trend is certainly in good company! The emphasis of smooth metals on chunky bracelets, rings, and even chokers presents a stellar trend for spring. Worn by models for high-fashion brands like Balenciaga, Ferragamo, Lanvin, Rodarte, Dries van Noten, and Givenchy prove this point, as they showcased this trend in gold, silver, and platinum previously on the runway. This trend is worn well with high-contrast clothing, for example, black and white patterns and clothes that feature large color blocks. With the sun shining brightly and flowers in full bloom, spring is the perfect time to enjoy a splash of color! 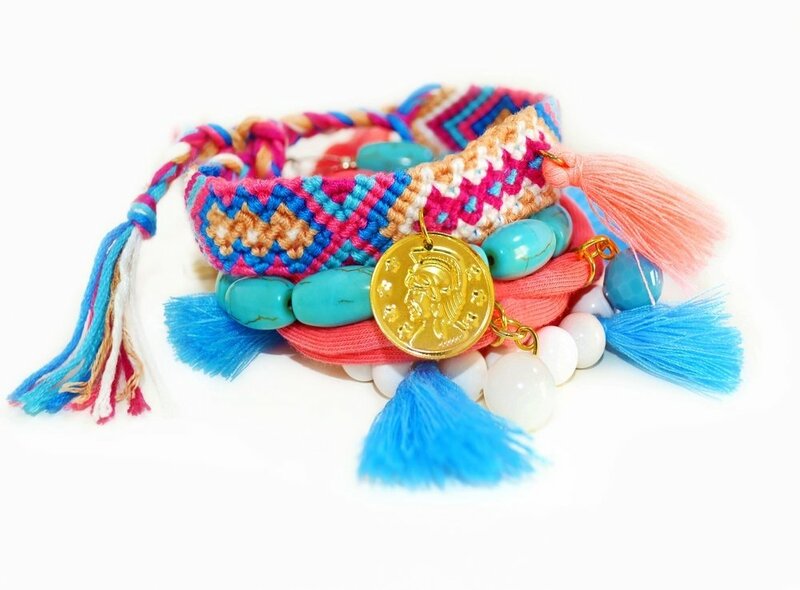 The bohemian-inspired style that comes along with brightly colored, chunky beads is the perfect jewelry choice to celebrate the change in weather and to brighten up anyone’s sense of style. Designers like Ralph Lauren, Tory Burch, Dolce & Gabbana, and Gucci are just some of the fashion icons that have taken part in this trend. The best jewelry for spring presents the perfect chance to enjoy bright colors and new materials and styles that haven’t had their time in the sun all winter long. Spicing up an arsenal of accessories for a new season is just one more thing to look forward to in the spring!